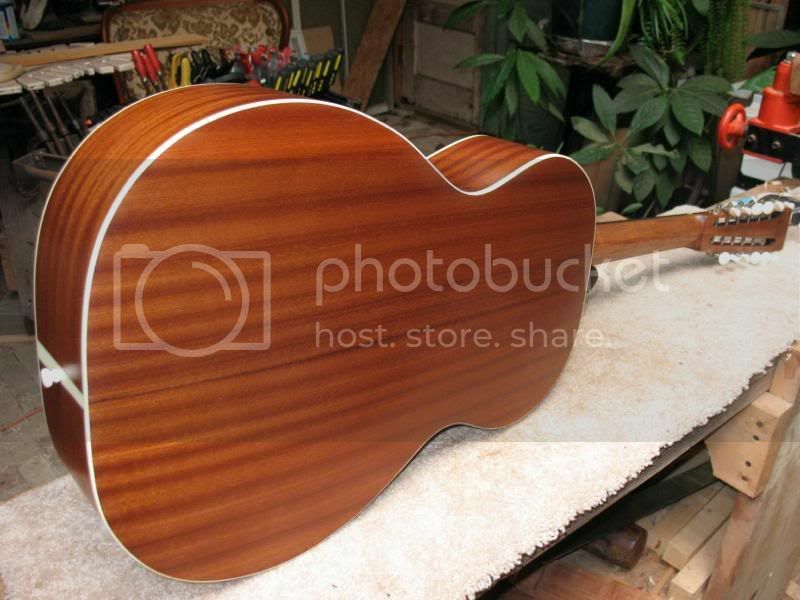 This is a Stella type, grand concert size 12 string that has been hanging around over a year waiting for a finish. It was my second build, first from scratch, after doing a stew-mac 000 that started me down this mad path. In hindsight I realize trying a 12 string for your first from scratch build with no plan probably isn't the smartest way to go. But I learned a lot, and it didn't turn out too bad. Sounds pretty good, and I think it's finally time to sand off the sweat stains and get it sealed up! Here is the ladder bracing pattern I used. 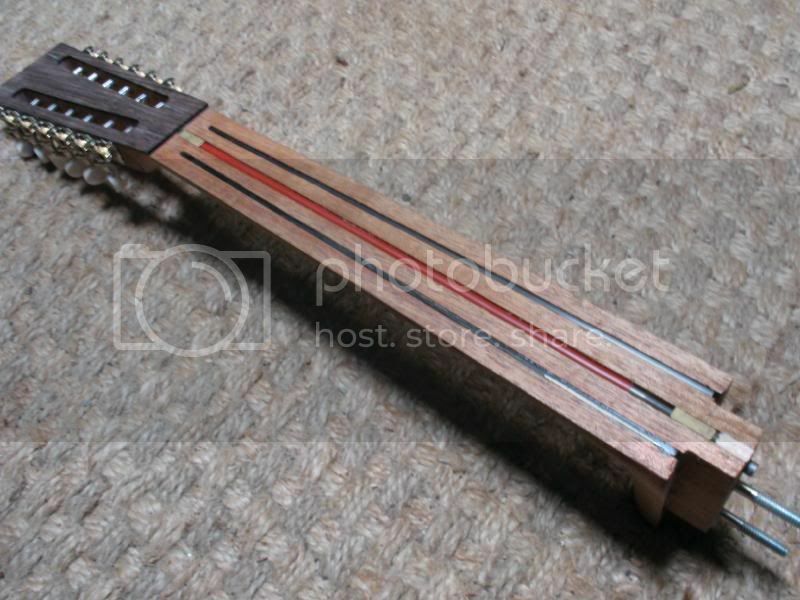 I basically copied a picture of the Stella 6 string bracing shown in the Stella book by Neil Harpe. 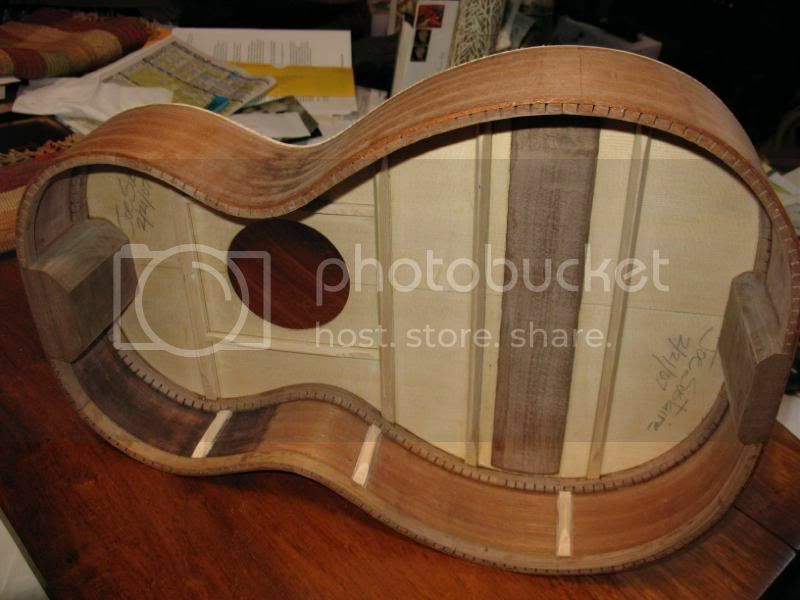 I added the brace between the soundhole and the bridge-plate thinking that a 12 might need more support there, and I added the bracing on each side of the soundhole because I had repaired old ladder braced six strings that had buckled there because of a lack of bracing. You can see I'm proud, I signed the top twice. Later I figured out that I had overbuilt the top bracing, so went in with a little plane and carved down the added brace between the bridge-plate and the soundhole to about 1/4" tall. That seemed to open it up a lot. Here are the sides, ribbon striped sapelle. The top on and ready for the back. And on the neck I used a stew-mac hot rod truss and two carbon fiber rods, to handle the stress. And there it is on the left, in the white but sounding good, next to the stew-mac 000. So, for a finish I wanted a black top with natural back and sides. I had first seen this on a Huss and Dalton guitar ad in acoustic guitar, and then later saw Hesh use that finish superbly and was sold. I used a spray-can nitro lacquer black with a satin nitro spray-can clear over it. My surface prep wasn't perfect on this one and the year spent playing in the white told me I didn't want to try for a perfect glossy black finish on this one. But I think it's gonna look pretty good. 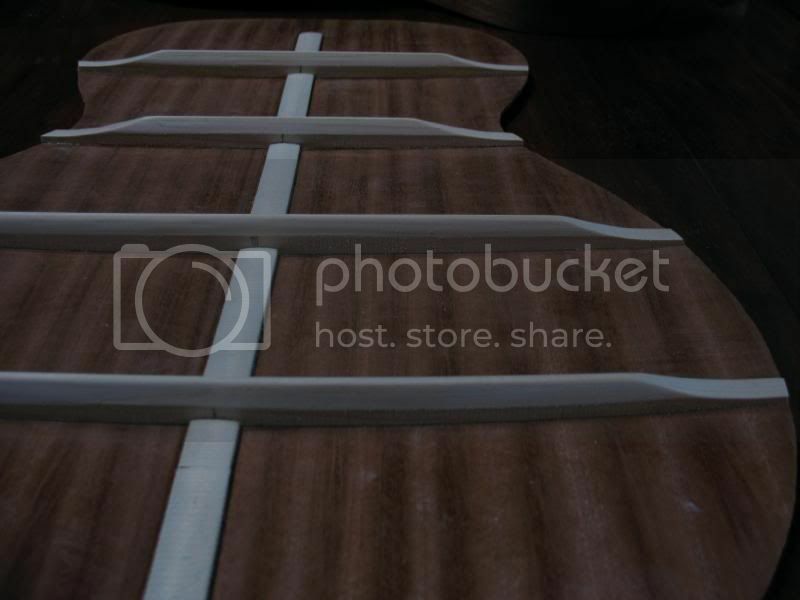 Tung oil finish for the neck and back and sides. Can't wait to get it back together and finished. Stringing one up to see if it's going to work is not a bad idea, but it sure makes it hard take it back apart and finish it then. As I've done a few more builds I'm trying to get a handle on impatience! That sure is a pretty axe, Joe - Classic lines, nice color scheme - She's a keeper! Thanks Eben and Z, it's got several coats of clear lacquer, satin sheen over the black. The satin finish makes it a little more forgiving of surface imperfections and future playing wear. At least that's my theory! I need to let it cure a bit more but I'm getting antsy to string it up. Okay, to catch up here. After giving the finish several days to cure, I started stringing it up. As I got all the strings on and started tuning it up, the bridge let go with a big pop. After pulling out what's left of my hair I consulted our esteemed community with my problem. Eben asked for details and I explained. 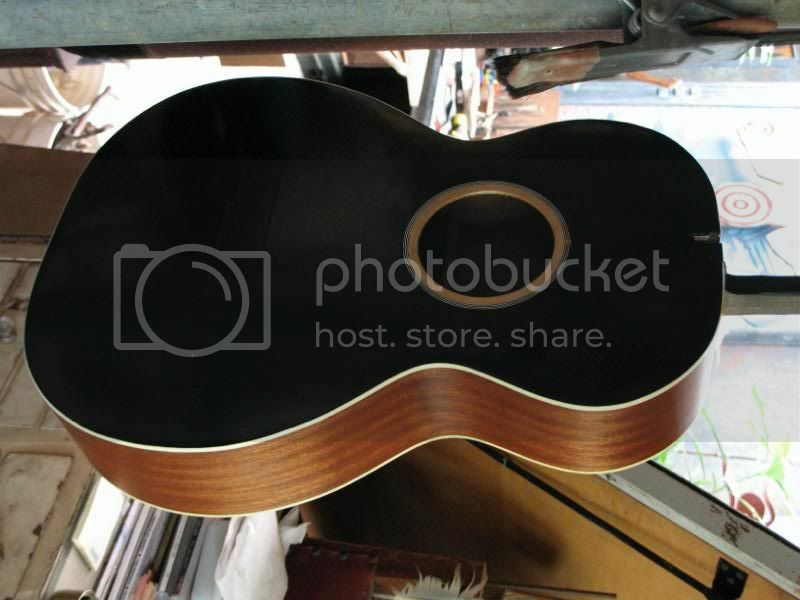 Since this guitar had been knocking around a little over a year in the white, it had a few dings and blemishes on the top which I filled with 5 minute epoxy, and spread with a squeegee. After it hardened I sanded it back as much as I could with a reciprocating sander, trying to get back to wood with just the dings filled, but couldn't ever quite get there. Kind of like pore filling with epoxy, you could still see a difference between the epoxy areas and unfilled areas. I then masked off the bridge area and finished top, back and sides. I glued on the bridge with LMI white glue after fit sanding the bridge. Now I had fresh glue but had been keeping it in the fridge. I didn't let it warm to room temperature before using. So the consensus seems to be that the glued failed because of the epoxy contaminated top not giving a wood to wood surface for the wood glue to bond to, with possible additional complications contributed by the cold glue. Thank you Grant and Eben for coming to my assistance on this. The good news is that it is back together and playing and sounding good! Now notice here the pearl dots on each side of the bridge. When I glued again I went with HHG, my first time, and it went well. I also made sure to scrape the hell out of the bridge area and re-sand the back of the bridge. But since I was working with an epoxy contaminated top and had glue failure once, I decided to add a little insurance with a couple of bolts, adding a little mechanical connection as well. And on the recommendation of Holy Ghost, Mike, I also added a bridge doctor under the bridge. It already had a little bellying from being strung up over a year, this has a 26 1/2" scale by the way with extra heavy strings. This took care of that and really improved the action and sound. Before it had too much resonance or ringing, this seemed to really tighten up the sound. Before it was like I had to slow down and simplify my notes or the sound would all just seem to run together, too much. Now it's doesn't do that and is a pleasure too play. This just shows the visual contrast between this and the last parlor I built. Kind of funny. Joe she is done and she looks very nice, you are building very nice stuff brother and you should be very proud of your achievements. How does she sound, and I love the striping from the wood grin, I have not had a problem as of yet with the bridges, but yes old glue or area not preped right will cause failure. I love the black top!! The views expressed in this post are my opinions and should not be taken as the only way to do things. They are offered as personal points of view and it would be helpful to be taken with a grain of salt. 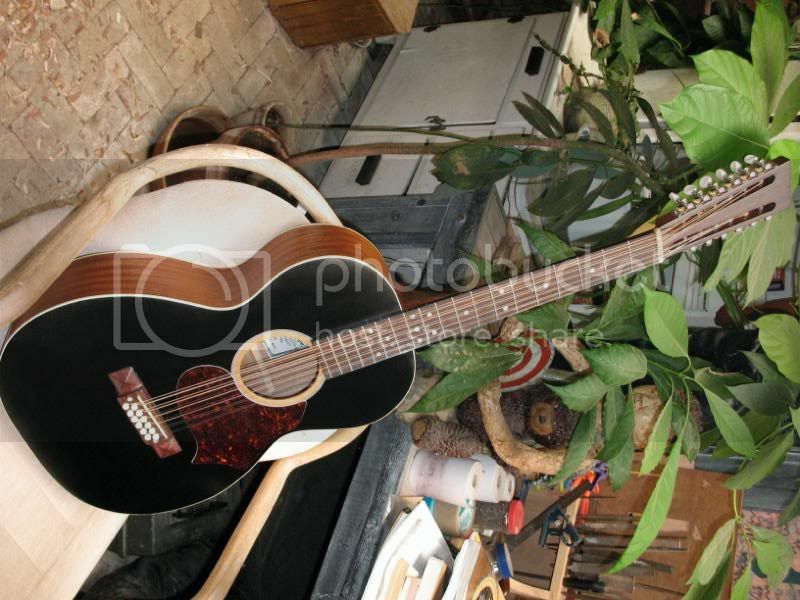 Love that 12 string! Nice work my friend! Nice work all around, Joe - I love them Bridge Docs, too! Okay...I have heard of these bridge doctors, but have no experieince with them. 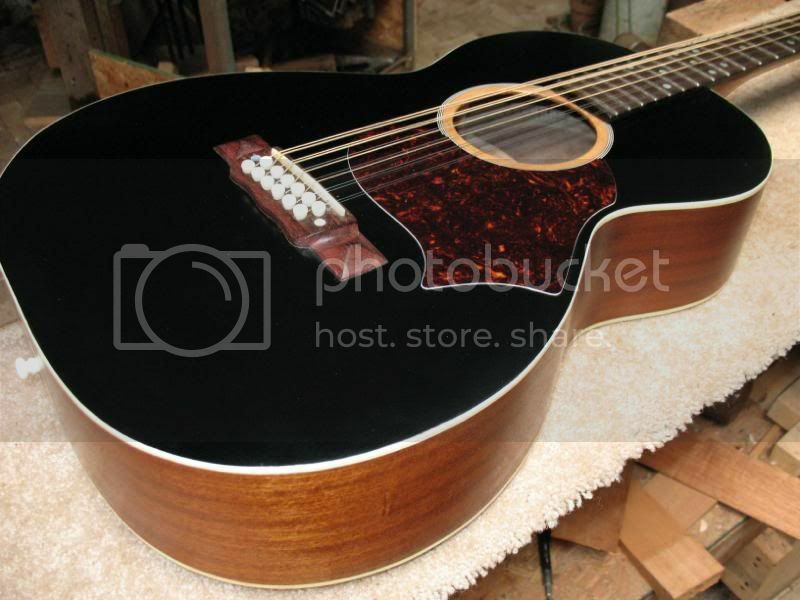 I have a 12 string that I built several years ago that has a severe belly buldge that makes it almost impossible to set up proberly. How do they work, what do they look like, and where do you get them. Ya see...even us old dogs have stuff to learn. Thanks guys for all the nice comments. I'm sure enjoying playing her. 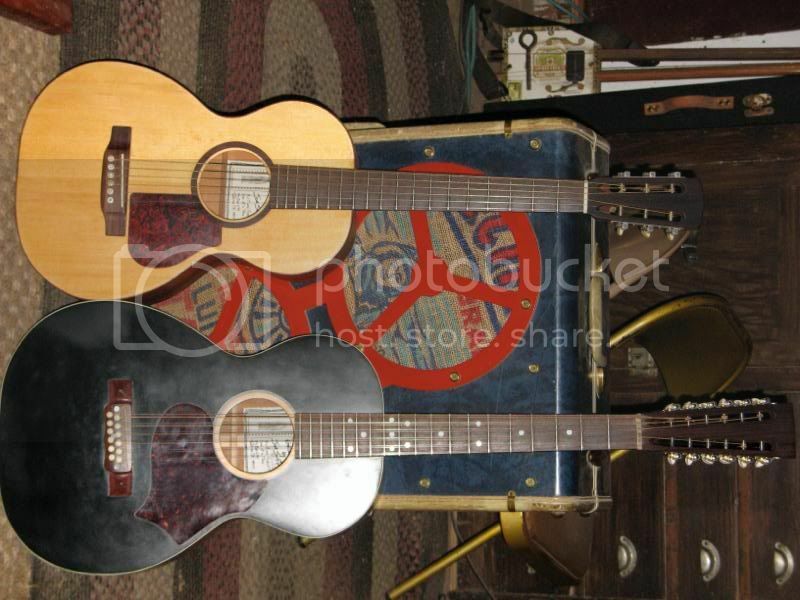 These old guitars like they used in the 20's and 30's are what got me started building. 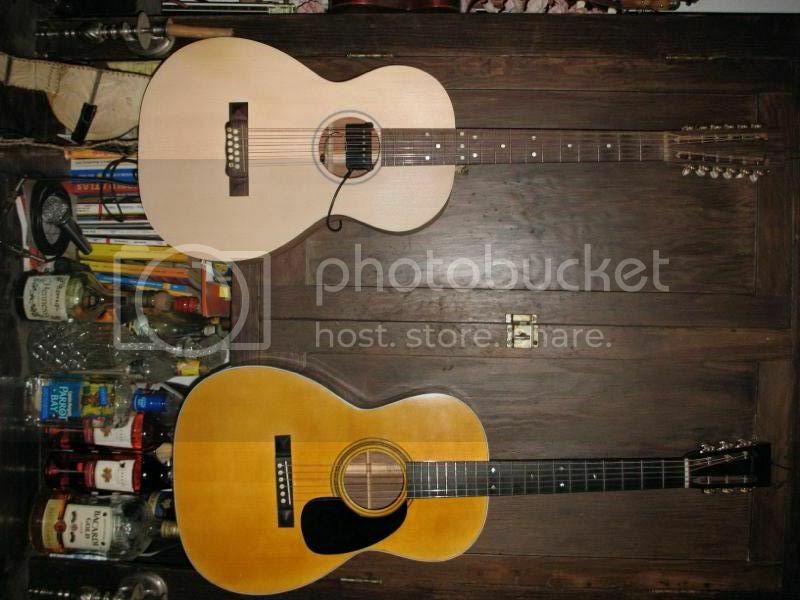 The good old Stella types and especially the long scale 12 strings were just out of my reach. But I'm playing now! David, stew-mac carries the bridge docter, just 22.50 for the one I used, you do have to drill a hole in your bridge for attachment. 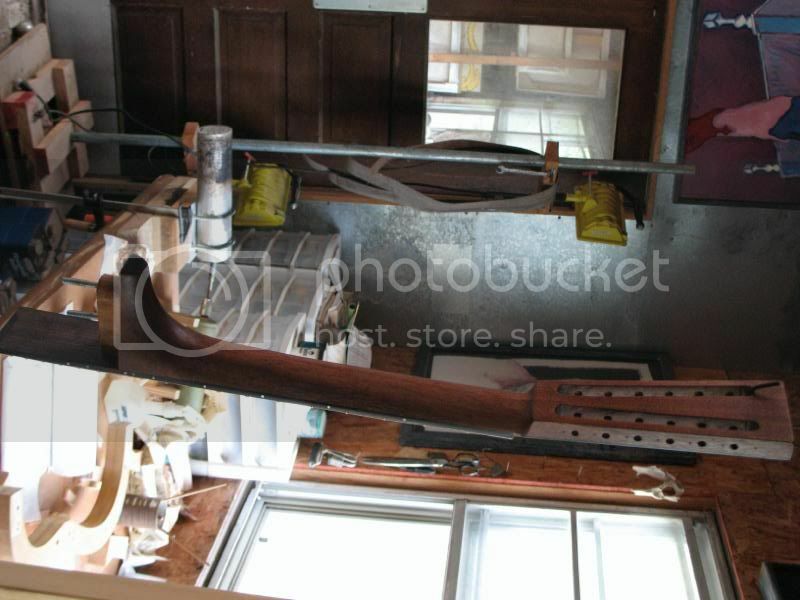 They have another model that uses special brass bridge pin bolts that is 52.75. If you've got a stew-mac catalog you can see a picture. So basically it's bolted to your bridge and via an adjustable pressure post transfers the stresses to the end block. Somewhat like the sound post in a violin or upright bass. This is the first time I've used one, but I'm very pleased. Holy Ghost here has a long history with 12's and said he puts them in all of his. Do you ever sleep? You are tearing the place up. Hey guys this is an update. I've been aware for some time that the trebles seemed weak on this, and I just ran into this on my Ditson ladder brace where I tried a bridge doctor because of bellying and found that it really weakened the sound, especially the trebles. So I just went and pulled the BD out of this one and it really opened the sound back up. Now this one has an extra brace in front of the bridge so I think it will be all right. 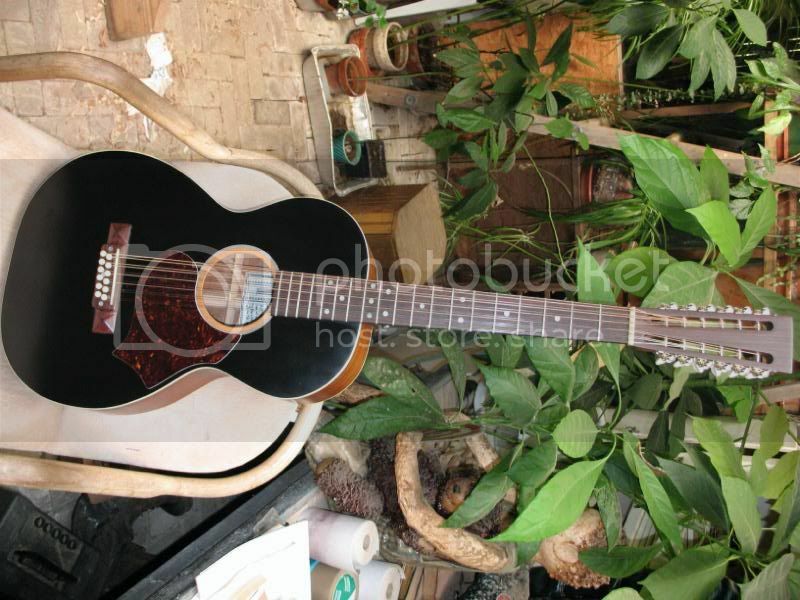 Scale on this is 26 1/2" and it's tuned down two full steps to a C, giving you that old time 12 string sound. Sounds much more open. As I found on the Ditson, the BD certainly will save a guitar and level the top, but it leaves the sound kind of compressed, dampens the sparkle. 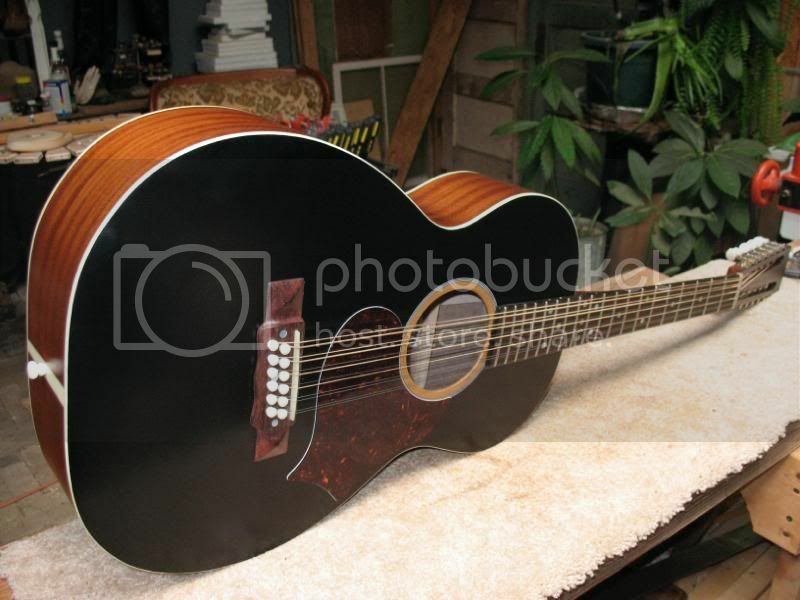 D*#@ Joe, you sure do build nice guitars. With that longer scale , how does it sound? I suspect it has a wee bit of bass? Thanks Nick, yeah the old blues guys often referred to these long scale, low tuned 12s as "lap pianos". Just wish I could make them talk like those guys could! I'm trying though. Outstanding, Joe. You are on a roll! 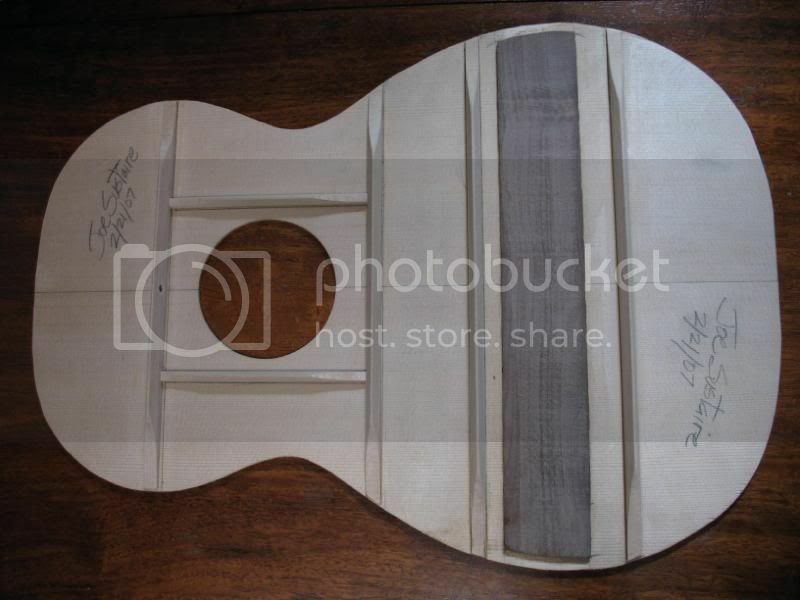 Thanks Waddy, sure enuff something addictive about building guitars! And have you noticed, each guitar has new songs and riffs to teach you? That's a cool axe! Between you and Hesh, I'm really warming up to the idea of black tops. So, how long is the "long scale" on this? I gotta talk to you about this. I'll do it in a PM though. If it doesn't sing it is just furniture. Looks like all nose to me!! And here I thought you weren't going to embarrass me in public, you were going to send me a PM. sustaireblues wrote: Hey guys this is an update. Hey Ed, it's the JLD Bridge Doctor, Stewart-MacDonald carries them, you can check out their catalog on line. It's a pretty cool device that attaches under the bridge plate and transfers the torque on the bridge to the tailblock. 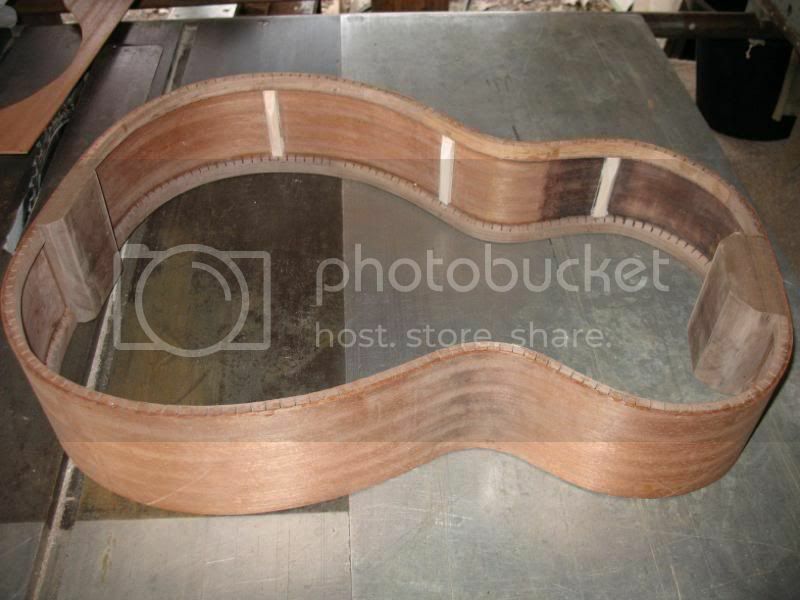 It will level out the soundboard if you have a bellying problem from too thin a top or inadequate bracing. 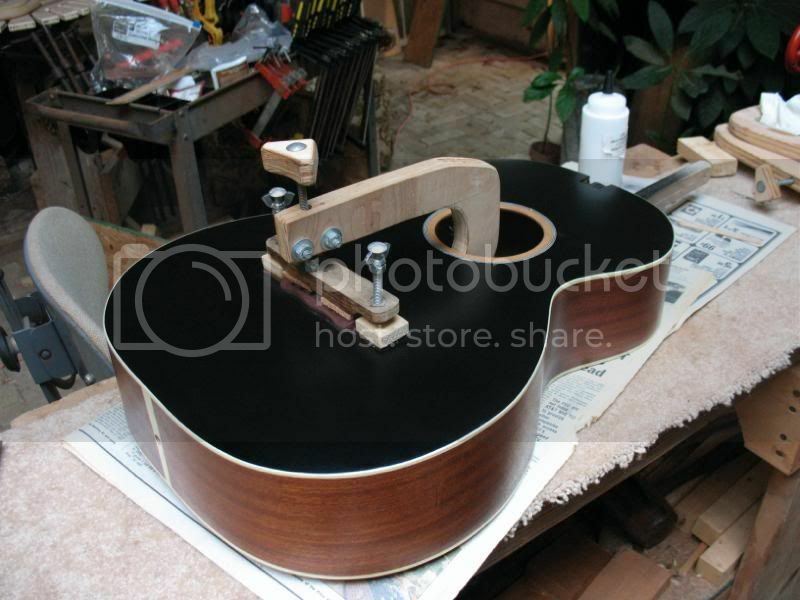 They can restore playability to a guitar whose action is too high due to soundboard deformation. So they do work, I just found that it did affect the sound. Kind of a trade-off to me, sometimes worth it, but not in this case for me. I would be curious to know if anyone actually got acceptable results with this device. ---perhaps it might sound good in the case of EXTREMELY light bracing... but it looks to me like with this device valuable vibration from the bridge is transfered directly to the back and tailblock - and would be lost there. From my experience these kind of supports (like Dennis's beautiful madman guitar#1 ) work BECAUSE THE SUPPORT DOES NOT TOUCH THE SB... and therefore still allows the SB freedom to resonate and make sound. 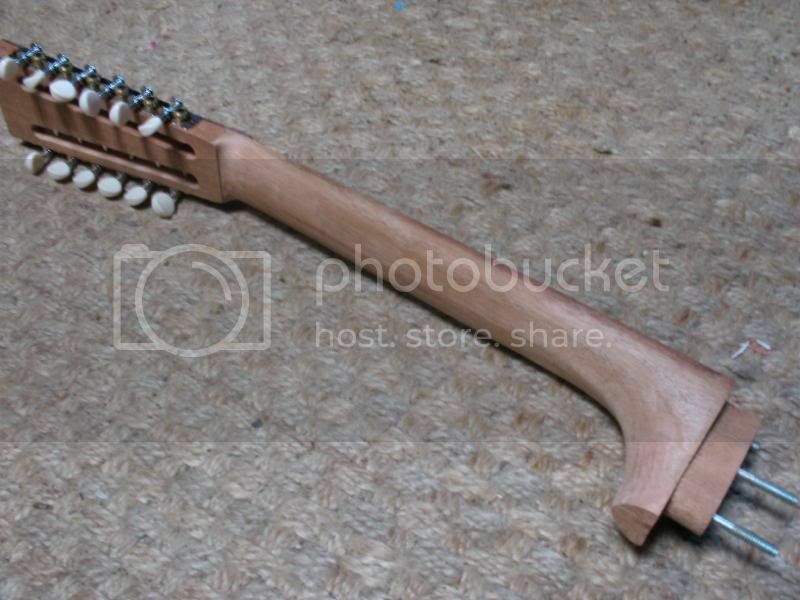 In my opinion, a better solution to this problem, in an extreme case is to reach in and add a bit more bracing material - - - I had to do this on a couple of instruments that I made actually... solved the problem and improved the highs too. Not so easy to do, but not impossible.